A Chinese fishing crew has been sentenced to up to four years behind bars and nearly $6 million in fines after being caught with 6,600 sharks off the Galapagos Islands. The incident sparked protests in Ecuador. Shark fin soup is a delicacy in China. As of Jan. 1, it's the soup that dare not speak its name.Shark fin soup -- a Chinese delicacy, one sometimes eaten for special occasions like weddings or Lunar New Year celebrations -- is now illegal in Nevada because of a law signed in June 2017 by Gov. Brian Sandoval. That law, SB 194, prohibits the sale of products or body parts from sharks, rays, sea turtles, narwhals and 10 other animals. 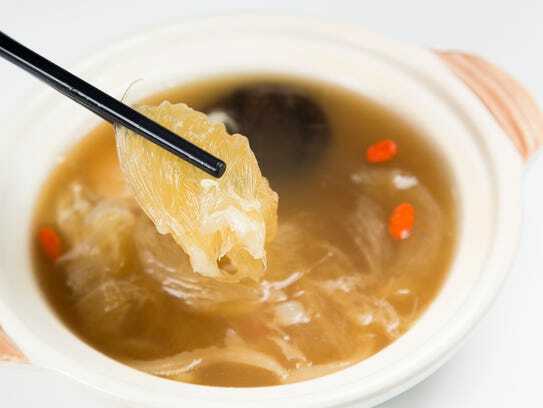 Shark fin soup derives its signature texture, a sort of snappy chewiness, from the fin, which is soaked and boiled so that it separates into "needles" or "noodles." Shark fin itself is nearly flavorless. The flavor comes from the broth, rich and silky and traditionally made with ginger, chicken and Yunnan ham. Newer versions might include a splash of Cognac (instead of vinegar) for extra luxury. In the last 15 years or so, shark fins have become increasingly controversial or have been outright banned because they're often harvested through finning, a process in which the fins are removed and the shark tossed back in the ocean, unable to swim (and thus survive). Commercial fishing also threatens sharks worldwide, something made worse by the fact that sharks mature slowly and have relatively few offspring. 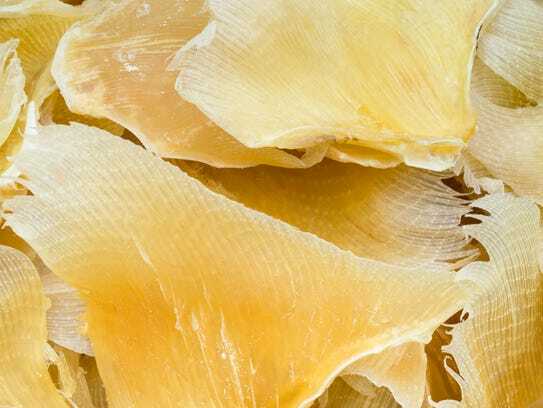 On Jan 1, 2018, a law went into effect in Nevada banning the sale of shark fin (shown here dried) or products made from it (like shark fin soup). Although shark fin consumption has declined in mainland China and Hong Kong in recent years, with shark fin soup now forbidden at state functions, its consumption has increased in Nevada, "largely associated with the increase in visitors consuming shark fin and new casinos catering to them," according to Shark Stewards, a marine conservation group. To date, according to the group, Nevada and 11 other states (plus three U.S. territories) ban the sale of shark fin and products made from it. In November 2017 during his trip to Asia, shark fin soup was served at a state dinner in Vietnam for President Donald Trump. Shark fin also is a delicacy in the Southeast Asian country. In Reno, several restaurants have offered shark fin soup over the years, either at special dinners or on their menus or both. Chi in the Peppermill Reno has served the soup, as has Jazmine in South Reno for banquets, but the dish does not currently appear on the regular menu of either spot. Over the years, shark fin soup also has been served by a handful of area restaurants that are now closed, including the magnificent Golden Fortune in the Eldorado Resort Casino, Yen Ching (for its annual Chinese New Year feast), and lavish Gi Fuh Loh in Harrah's Lake Tahoe in Stateline. Reno restaurants have served shark fin soup over the years, but as of the start of 2018, none list the real (non-imitation) version on their menus. The delicacy fetches $50 or more per bowl. Some local restaurants also have sent out imitation shark fin soup, often made with bean thread noodles, but the imposter is easy to spot: It's priced at, say, $10 a bowl, not the $50 a bowl or more that real shark fin soup commands. Shark fin itself can fetch more than $300 a pound. In Las Vegas, the situation is different than in Northern Nevada, with at least 14 restaurants serving shark fin soup, according to the most recent information from the Animal Welfare Institute, an organization that combats cruelty to animals. Five of these restaurants are in Las Vegas Strip casinos. The AWI does not list any restaurants outside of Vegas as serving shark fin soup.